We assure you, the Pudelpointer is a real dog! It’s a cross between the Poodle (otherwise known as Pudel in German) and the English Pointer. They have the intelligence, love of water, retrieving instincts, easy trainability, willingness to please, and the protective coat of the Poodle. It also has the Pointer’s endless desire to hunt, pointing instincts, field nose, and endurance. In case you couldn’t tell already, this canine is the perfect hunting dog. Learn more about the pup that is as striking as it is smart, below! The history of the Pudelpointer started in 1881. German breeders Baron von Zedlitz and Hegewald wanted to create a better hunting dog. They bred their own canines together first. But, it took around 30 years of trials and errors. Eventually, 11 Poodles and 80 different English Pointers did the job. It wasn’t until 1956 that breeder Bodo Winterhelt brought the first Pudelpointers to Canda. Bodo is still a massive influence in this region. His efforts helped to found The Pudelpointer Club of North America in 1977. However, they aren’t common in the United States. This is because breeders don’t want the American Kennel Club (AKC) to recognize this dog. Doing so will put too much emphasis on form over function. Want to be the proud owner of an official Pudelpointer? Yours will have to pass several rigorous hunting and breeding standards. It’s a title that needs to be earned! One of the things makes the Pudelpointer famous is their gorgeous looks. Their adorable face looks like it has a beard. Wire-haired: The hairs are longer at some places on the body, like on the legs or the underbelly. You’ll find the trademark beard with these coats! The fur is hard to the touch, but it’s great for dogs working in the fields. The hair isn’t too long that it gets in their way of working. Smooth and Short: This look is not usual for standards. However, it’s excellent for working in the field and keeping these working pups cool. Rough: These longer hairs are usual for breeding. You’ll also have one with a beard. It’s softer to the touch and keeps them warm and agile in water and colder environments. Their body has a double-layered coat that is also weather resistant. Pudelpointers are great for allergy suffers, because their fur is hypoallergenic. This means little shedding! Their colors are liver, chestnut, and occasional black colors. They can also have small white markings. A few other distinctive features of the Pudelpointer are their droopy ears and gorgeous, bright eyes. Not only are Pudelpointers fantastic hunters, but they’re also brilliant for any work outdoors. Their willingness to please, incredible smarts, and friendly nature mean they love learning new tricks. With their calm, self-controlled, and tireless nature, the loud and hectic lifestyle that is hunting won’t scare them. 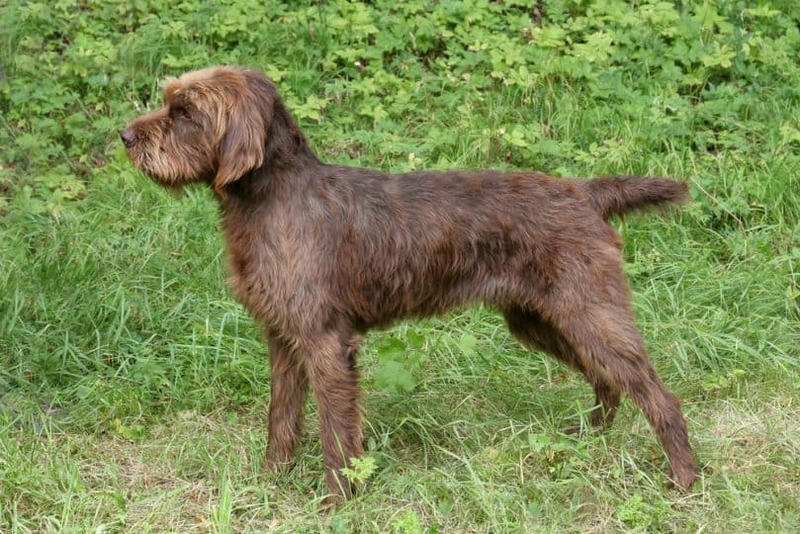 Overall, Pudelpointer’s temperament is fantastic for active families or for individuals looking for a great hunting company. Since they’re best at retrieving ducks, their strong hunting instinct makes them a natural in the lakes or rivers. Water rescue missions are a piece of cake for these dogs! You may not want one if you have smaller animals in the house. Sadly, Pudelpointers and cats don’t get along well. They are also prone to anxiety around strangers and separation anxiety. It makes them fantastic guard dogs, but you won’t want to be away for extended periods of time. There is a difference in size between male and female Pudelpointers! Males weigh between 44-66 lb (20 and 30 kg) and grow to be as tall as 24–27 inches (60–68 cm) tall. Females weigh between 44–66 lbs (20–30 kg) and grow to be 22–25 inches (55–63 cm) tall. Since these dogs are hypoallergenic, they don’t shed a lot. Grooming is an excellent way for an owner to bond with their furry family member. Try to groom them at least once a week for some quality one-on-one time. Aim for an occasional bath to keep them clean and looking their best, especially if you’ve returned from a successful hunt! You’ll need to trim their strong and fast-growing nails once a month. Claws are prone to overgrowth, splitting, and cracking if not properly looked after. Check their ears weekly to avoid a buildup of wax and debris. Make sure to clean their teeth daily to prevent bad breath and plaque buildup. 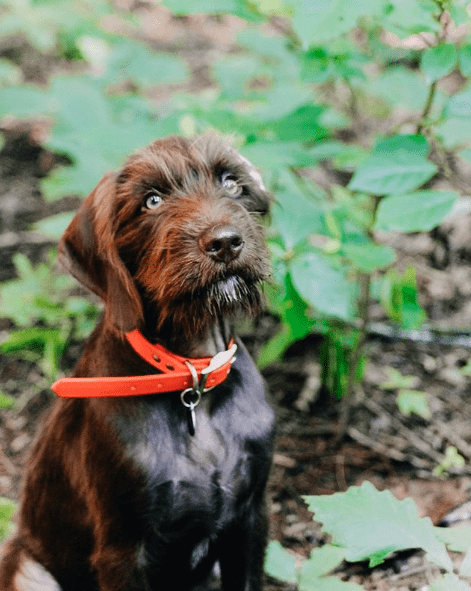 We recommend starting training early with your Pudelpointer puppy! Get him around other pups and younger children. Start working on basic commands like sit and stay. This way, they’ll grow used to the sound of your voice, ensures you’re the alpha dog and squashes disobedient behaviors from rising up in the first place. It’s a win-win situation! 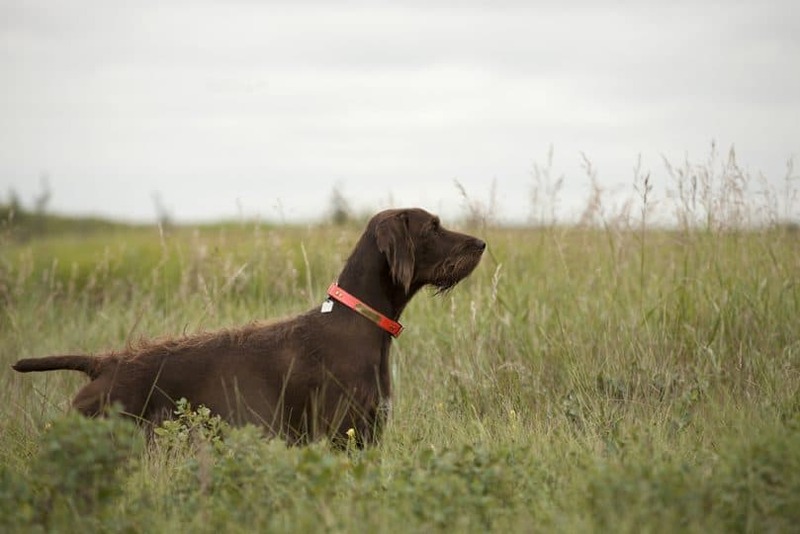 Check out this video of an expert hunting training his Pudelpointer for inspiration. In case it wasn’t obvious before, these dogs need their exercise. They were bred to hunt, after all! Plan lots of time in a fenced backyard. Play some games of fetch, chase, or tug of war with your Pudelpointer to keep them happy and entertained! You’ll also want to go on many daily walks to spend all their energy up and won’t use it to chew your furniture. Another great idea is to take them out for some swimming! They love the water! The Pudelpointers have a lifespan of 14 years! But to keep their life expectancy up that high, you’ll need to be on the lookout for a few potential health issues. They are prone to hip dysplasia and epilepsy. Both are severe genetic problems, so be on the lookout for initial signs of these diseases. As well, speak with your breeder to ensure these issues aren’t bred down to your pup. These dogs love to gobble up food, so they’re also prone to becoming overweight. Use high-quality food only. Be smart about the calorie consumption versus calories spent. Overall, you’ll have a healthy dog and won’t have to worry much! These dogs are hard to come. With their strict breeding and hunting regulations, many haven’t taken up the challenge. However, they are available in most states and throughout Canada and the UK! Do your research to find a responsible breeder near you! This means visiting their house, checking medical records, and asking for references. The price for Pudelpointer puppies ranges around $800-$1000. Pudelpointers rescues are even harder to come by. They aren’t usually up for adoption. Their owners just don’t want to let them go. There are good and bad elements of these dogs, depending on what you and your family need the most. Do you want to add the Pudelpointer to your family for lots of outdoorsy adventures? Let us know in the comments down below!